TW loves the composition of this pic which is why it’s our official entry. Mirror mirror on the wall. Who’s the most stunning cat of all? Heh heh. I know the answer to that question and I hope you do too. Mirror is Week 8 of 52 Snapshots of Life challenge presented by the one and only Lazy Pit Bull. This challenge seems to be getting the pit bull to visit me but maybe perhaps being a cat I shouldn’t be inviting pit bulls over here. We have lots of mirrors in our condo. It’s not cos the peeps like to admire themselves but rather to capture the beauty of the Manhattan skyline. With the mirrors perfectly placed, you can see the skyline’s reflection from practically anywhere in the condo without looking out the window. These older snapshots don’t capture the skyline. They capture something even more stunning: ME. The pic above and directly below was taken on TW’s messy dresser. 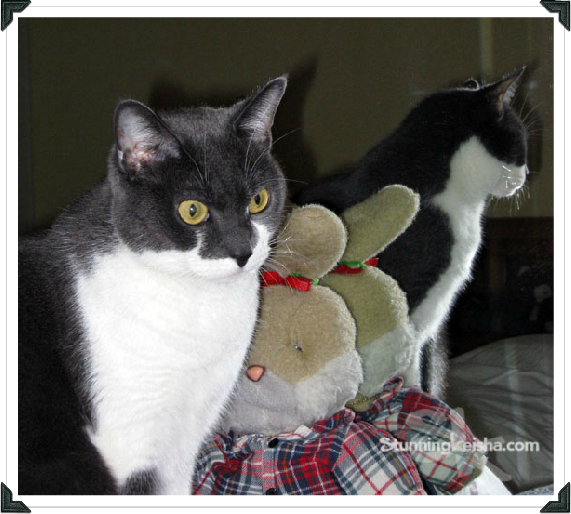 Can you believe that rabbit is photo bombing me? These next two were taken during one of my lovefests with Pop at his dressing table. Unfortunately, TW hasn’t had me pose near a mirror in about 3 years or maybe I’m just too quick. Pop, what’s taking you so long? I love when Pop pets me. Now excuse me while I hop into my smock and beret cos I’m gonna participate in the Caturday Art Blog Hop that Athena and her Mum Marie host every week. We just found out that yesterday was the 25th Anniversary of Photoshop so we’re gonna try to do our art using PS. 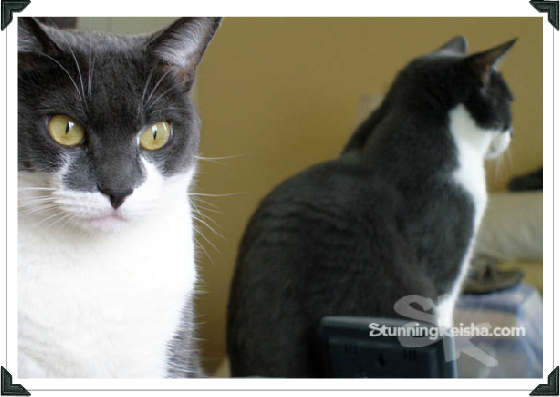 What did blogging cats do before PS? This is another mirror pic taken on TW’s messy dresser. She says it looks like I’m in church. MOL! Put on your 3-D glasses fo some fun. First we posterized it in PS, then applied a 3-D action. 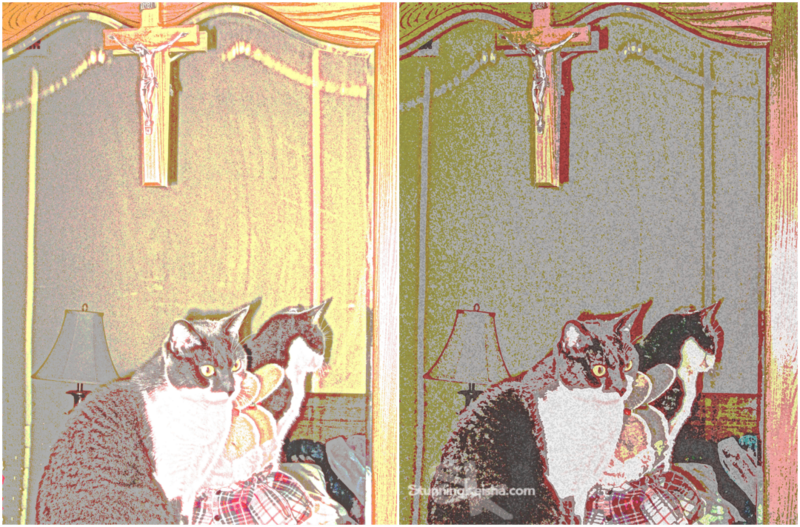 In the second image, we added the sponge filter. You can biggify them to get the full 3-D effect. Don’t you think two Keishas are definitely more stunning than one? Speaking of Photoshop, those pics of me shopping in PetSmart were all photoshopped. HAH! Did I fool anybuddy? Great pic! Smart of your peeps to utilize mirrors to accentuate their view! Cool mirror shots! Although my crazy human wants to see some of the Manhattan skyline too... she loves New York. Nice one CK and yes the more the merrier. Have a super Saturday. You are quite the stunning duo CK! I really like the mirror shots where we can see your face and also your profile. Very nice, CK! We really like this picture! CK we thought you had gone to Church too! What great photos and we love the mirrored effect!! Yes, we agree. Two stunning Keisha's are better than one! Well we think that a whole blog of stunning Keishas is heaven! 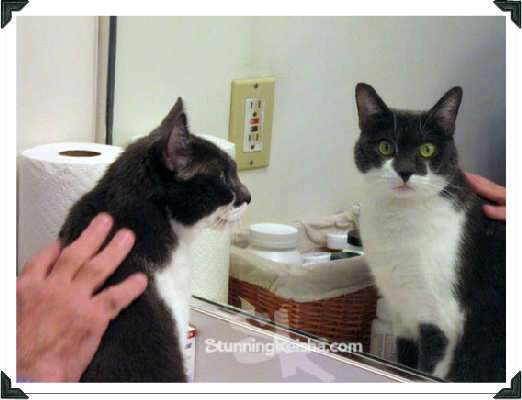 Love your Caturday Art as well as your mirror pictures. Doubly awsome grrl furrend or should mes says Double the Trouble! Definitely double the stunning!!! Not that you don't have enough the stunning-ness to fill the universe, of course!!!! I love your mirror pictures. They are a good example of purrfection! I like your official entry too! Besides the composition I love the way your eyes go with the background. Two Keishas are definitely more stunning, but do you think the world can handle more than one of you? It's a great idea to put mirrors so you can capture Manhattan skyline. And of course to capture more of you :-) Those mirror photos are beautiful. I love the composition of the first picture, too. And the art images are great! Sponge filter gives such cool 3D effect. Happy Caturday! So much of your stunning beauty in one post has made my heart race! You did fool me- I wondered how come you didn't have a harness on. Your Mom did a great job photoshopping you in. Great photos of you! You shine brighter than the NYC skyline at night SK! 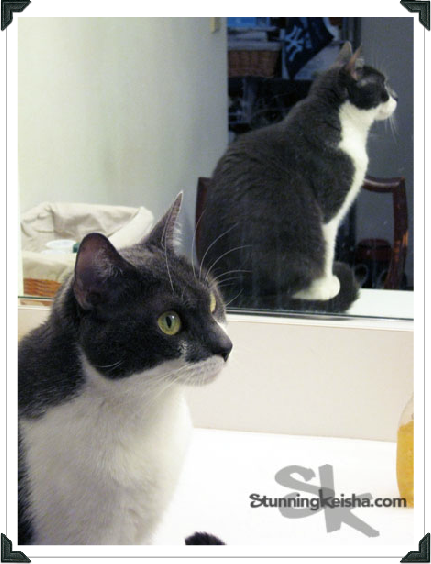 Pawsome mirror pics and even more pawsome artwork! We really love all the mirror shots TW has taken of you, CK, what a wonderful idea and of course, yes two CK's are even more stunning than one. Cool entry for Caturday art too. Our day is complete: BOTH sides of stunning at ONE TIME!!! That is a very nice picture ! Now we know why you are called Stunning Keisha! That is a cool idea having mirrors to see the skyline. We don't have anything like that out our windows, so mirrors are pretty much limited to the bathroom and a full length one Mom claims she needs some days. Nice images, especially the first. I didn't know yesterday was Photoshop's birthday. I would have sung the song. Before Photoshop more cats were forced into real hats and other clothing. Cats should have a thanksgiving celebration for software. CK, you are stunning from EVERY angle!! !